Congrats to Leah for winning the Food and Wine Magazine Giveaway. Leah, contact me on my facebook page and I'll get back to you through there with details. 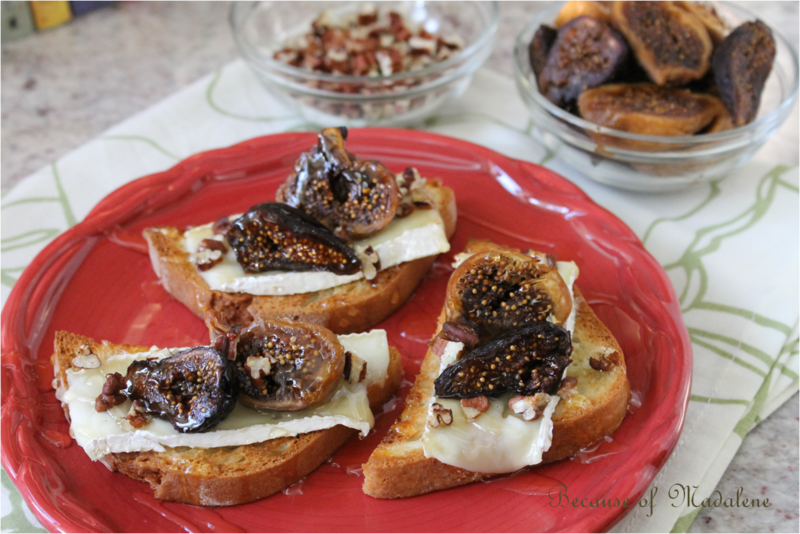 Recently my mom was reminiscing about her childhood and how she, Madalene and the rest of the family would take a dried fig and stuff it with a walnut for a quick and easy snack. This got me thinking about how I could reinterpret that fun memory into a small meal or dessert. So I picked up some dried figs and plumped them up (by re-hydrating them in a pot of hot water for 30 mins) for a Fig and Brie Bruschetta. I love finding new ways to enjoy Bruschetta without having to stick with the traditional tomato topping. So with this dish, I went a sweeter route by pairing a creamy and buttery brie cheese with the sweet figs, a drizzle of honey and crunchy pecans. Filling and loaded with lots of different textures and simple flavors, this easily became a rustic Italian treat that satisfied that fig craving I've been having all summer long. On a foil lined baking sheet lightly sprayed with cooking oil, lay out the bread slices and drizzle with a light layer of olive oil. Toast them under the broiler until they are golden brown, about 3 mins. 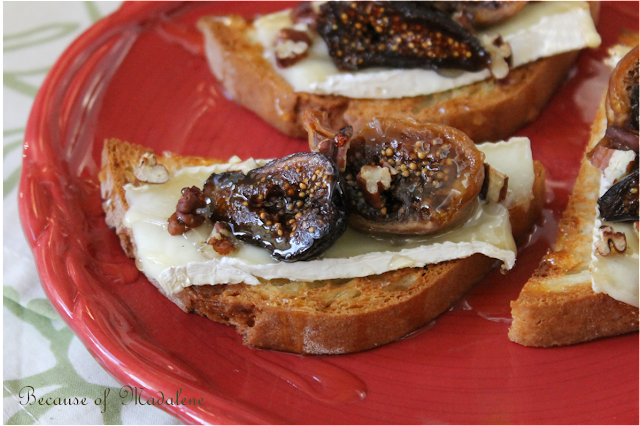 Layer on the sliced brie cheese, halved figs and chopped pecans. Bake (on the middle rack) in a 400 degree oven for about 20 mins or until the cheese has begun to melt. Place on a plate and drizzle with honey. Eat hot!